Kiwi fruit (also known as Chinese gooseberry because of its flavour and colour) is native to China since 700 years. Besides China, kiwi is widely cultivated in Brazil, New Zealand, Italy and Chile. It is a climbing shrub, which reaches approximately 9 meters. The scientific name for kiwi is Actinidia Deliciosa. Kiwi fruit usually grows under moderate to high rainfall conditions. 150 cm of rainfall is at least required for the sufficient growth of kiwi fruit. During summer, the fruits are injured by sunburn if the temperature goes beyond 35 degrees Celsius. Kiwifruit is said to be extremely nutritious, an excellent source of vitamin C and a very good source of potassium and folic acid. Kiwi provides approximately 10 percent of the recommended daily requirement of dietary fiber. Kiwifruit also contains vitamin E and an array of polyphenols and Carotenoids, which are required for good health. There are two varieties of kiwi: Gold Kiwifruit & Green Kiwifruit. 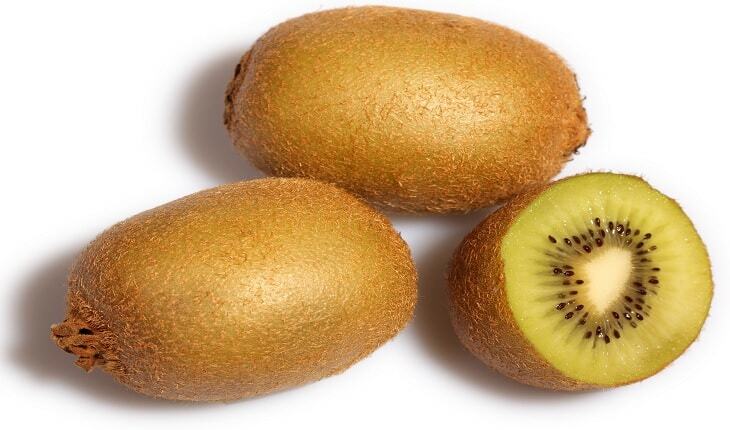 Gold kiwifruit contains more antioxidants and is healthier than green kiwifruit. Kiwi is a low glycemic index fruit, thus it is very beneficial for individuals with diabetes mellitus. * These nutritive values are per 100 grams of kiwifruit. The incidence of type 2 diabetes mellitus has increased greatly in the past 10-15 years. It is very important to keep plasma glucose levels under control to prevent the onset of diabetic complications. Wound healing is delayed in individuals with diabetes mellitus. Diabetic foot ulcer and infection is a common problem in diabetics. Hyperlipidemia is another very common problem that is increasing rapidly all over the world. Altered lipid profile further increases the risk of cardiovascular diseases. Therefore, it is very important to keep both LDL and total cholesterol levels well under control. It is very correctly said that all disease begins in the gut. Therefore, it is very important to keep the gut clean and healthy. Insomnia is a common problem in which people are unable to sleep. Studies have found that sleep disorders and neuropsychiatric problems are associated with increased levels of oxidative stress. It is very well known that kiwifruit is completely packed with vitamin C, which is a powerful antioxidant. Besides vitamin C, there are many other potent antioxidants present in kiwi. Consuming kiwi everyday can help your body fight oxidative stress effectively. Increased load of free radicals and reactive oxygen species has put human body at a greater risk of developing some diseases and disorders such as cardiovascular diseases, cancer, hyperglycemia, cataract, arthritis, ageing and so on. Uncontrolled plasma glucose levels, high levels of total cholesterol, high levels of triglycerides, obesity, and hypertension and platelet aggregation are some of the risk factors for cardiovascular disease. Research has showed that vitamins, minerals, antioxidants and polyphenols present in fruits reduce the risk of cardiovascular diseases. However, different fruits have different proportion of antioxidants and polyphenols present in them. Individuals with high blood pressure are at increased risk of developing cardiovascular diseases and stroke. Therefore, to cut down the risk of these diseases it becomes very important to maintain normal blood pressure levels (120/80 mm Hg). Cold and influenza are very common infections in humans. People who are undernourished or the ones who have poor immunity levels are at an increased risk of cold, influenza and respiratory tract infections. Furthermore, increased oxidative stress load along with poor nutritional intake enhances the risk of infections. Kiwifruit is rich in dietary fiber and has laxative effect. Eating a huge amount of kiwifruit on a daily basis may in turn increase the dietary fiber intake and cause loose stools or diarrhoea. Therefore, one should not consume too may kiwifruit at one go. Healthy individuals without any clinical conditions can safely consume at least two kiwifruit per day. Individuals with renal diseases who need to restrict their potassium intake should strictly limit or if possible avoid kiwifruit. Individuals with type 2 diabetes mellitus should consume at least one kiwifruit per day. Cancer patients who need to fight oxidative stress can consume at least two kiwifruit per day. Patients with infections such as cold or upper respiratory tract infections can consume one to two kiwifruit per day. Gholamreza Mohajeri, M. S. (2014). Effects of topical Kiwifruit on healing of neuropathic diabetic foot ulcer. Journal of Research in Medical Sciences, 520-524. Chang CC, L. Y. (2010). Kiwifruit improves bowel function in patients with irritable bowel syndrome with constipation. Asia Pacific Journal of Clinical Nutrition, 451-457. Annie On Chan, G. L. (2007). Increasing dietary fiber intake in terms of kiwifruit improves constipation in Chinese patients. World Journal of Gastroenterology. Lin HH, T. P. (2011). Effect of kiwifruit consumption on sleep quality in adults with sleep problems. Asia Pacific Journal of Clinical Nutrition, 169-174. Hunter DC, G. J. (2011). Antioxidant and ‘natural protective’ properties of kiwifruit. Current topics in medicinal chemistry, 1811-1820. AK, D. (2013). Cardio-protective Properties of Kiwifruit. Advances in Food and Nutrition Research, 273-282. Asim K. Duttaroy, A. J. (2004). Effects of Kiwifruit Consumption on Platelet Aggregation and Plasma Lipids in Healthy Human Volunteers. Platelets, 287-292. A Karlsen, M. S. (2013). Kiwifruit decreases blood pressure and whole-blood platelet aggregation in male smokers. Journal of Human Hypertension, 126-130.